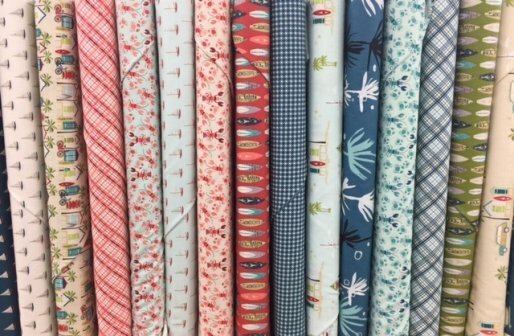 We have been very busy here at Beginnings - new FABRICS, new PATTERNS and new CLASSES! 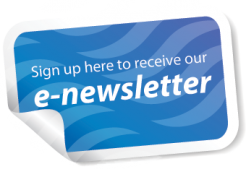 Have you seen the lineup of classes coming up? PHEW, what a lineup! Our classes even include Easter Baskets and a Bucket Brigade!! In case you haven't seen the schedule, click HERE. We would like to introduce 2 new teachers. 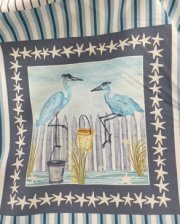 Nancy Evans makes tote bags and is offering a beginning tote bag class to learn about bag construction and different stabilizers. Then we have Sherry Hite, who just moved here from Arkansas. 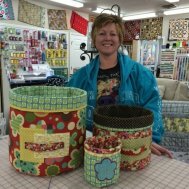 She will be teaching how to make these cute buckets that you can use all over your home. These are both make and take classes that you can finish in one day. 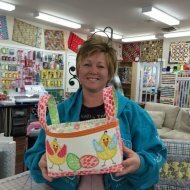 Sherry is also doing a one day class to make the cutest Easter Baskets for a child. Check our calendar for all the details. 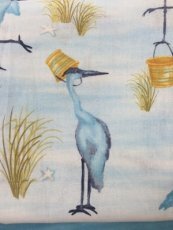 For those of you waiting..... we have gotten beautiful spring fabrics in! Thank you ALL for your continued patronage! We appreciate each and every one of you! !